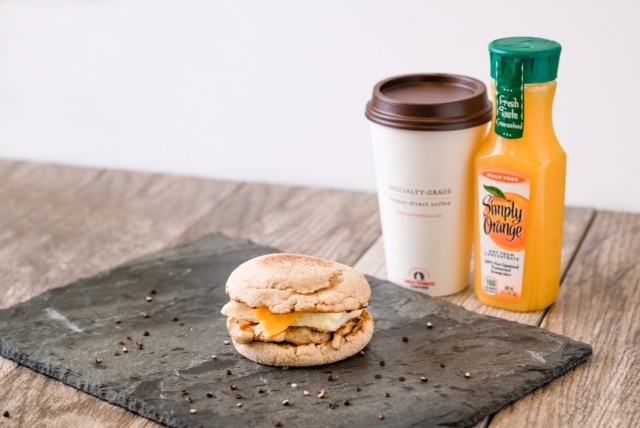 ATLANTA (July 18, 2016) –With American consumers eating breakfast away from home more frequently, Chick-fil-A today launches a new breakfast sandwich to meet the demands of those seeking a healthy breakfast on-the-go. The new Egg White Grill, a protein-packed breakfast sandwich, is the first new breakfast entree for the national quick-service restaurant chain since 2010. The Egg White Grill is a lower-calorie menu option made with a breakfast-sized portion of grilled chicken breast, freshly grilled egg whites and American cheese served on a toasted multigrain English muffin. The sandwich has 300 calories and 25 grams of protein and is intended to keep customers’ hunger satisfied throughout their busy morning routines. The sandwich starts at $3.35. Industry-wide, the breakfast daypart has grown more than 60 percent in the past five years. The Egg White Grill makes Chick-fil-A one of the first fast food restaurants to offer grilled chicken as a breakfast option, a move consistent with the company’s efforts to offer a menu of choice that accommodates individual dietary preferences. Chick-fil-A added breakfast to the menu in 1986, with the Chick-fil-A Chicken Biscuit. The chain has since added variety to the breakfast menu, including Chick-n-Minis, a Breakfast Burrito, the Greek Yogurt Parfait and a fresh fruit cup, which was a first for the industry when it was added to the menu in 2004. As part of further changes to its breakfast menu, Chick-fil-A today increased the size of its Greek Yogurt Parfait, which originally launched in 2015, from 3.5 oz. to 5.5 oz. The resized Greek Yogurt Parfait is 180 calories, 12 grams of protein and starts at $2.95. Beyond breakfast, today Chick-fil-A also adds a new Sweet & Spicy Sriracha dipping sauce and three new and improved sauce flavors — Smokehouse BBQ, Garlic & Herb Ranch and Zesty Buffalo – to its lunch and dinner line-up. The new and improved sauces were developed in a continued effort to meet changing customer tastes and flavor trends. Throughout Chick-fil-A’s history, the company has been on a journey to serve not only delicious food with a warm smile, but also offer a menu customers feel great about eating. Chick-fil-A removed trans fats from the entire menu in 2008 and removed high fructose corn syrup and artificial colors from dressings and sauces in 2015. The company is also committed to serving chicken raised with “No Antibiotics Ever” by the end of 2019. Most Chick-fil-A fans have their go-to orders, but what about those on the other side of the counter? We asked a few Los Angeles and Atlanta restaurant Team Members to share their top menu picks, as well as some insider tips for you to try on your next Chick-fil-A visit! You know the drill - morning rolls around, and the daily rush starts all over again. Whether rushing to finish a looming work presentation or packing the kids’ lunch, mornings can get hectic. And that’s when making time for a nutritious breakfast can become an afterthought. Which Chick-fil-A Breakfast Menu Item Are You? Morning routines — we all have one. Some of us work out before dawn and beat everyone else into the office, while others sleepily repeat, “just five more minutes,” and struggle to get out the door. Whether it’s structured or laid-back, that morning routine is perhaps the most important part of jumpstarting the day. The same goes for breakfast -- the most important meal of the day.